The 3 Day military diet is a strict eating regiment of 3 days. On days 4, 5, 6, & 7 you eat normally, preferably with a slight calorie deficit. See the FAQS for details. So you’ve lost weight on the 3 day diet. You stuck to the plan for your 3 days and then didn’t go crazy on your 4 days off. You may have even repeated the cycle a few times. You lost weight because you ate less calories than you took in. Congratulations! The diet wasn’t that hard to adhere to but it may have been hard to say no to the many temptations that always pop up. It wasn’t necessarily that you were hungry. It is that chocolate/soda/salted caramel/etc. can be so fun. But you held off and stuck to the plan. Now what? 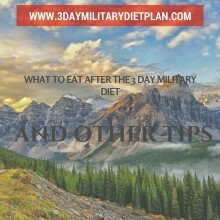 What to eat after the 3 Day Military Diet? Surely there is more to life than a little bit of tuna and carrots at night. You certainly can’t stay on the military diet for the rest of your life. The military diet is cheap and it does give you balanced nutrition. But it’s also not too fun eating the same thing day in and day out. So now that you have the weight off how do we keep the weight from coming back on? It is an all too common event that when someone who has lost weight ends up bouncing right back to their previous weight. It may even be more common for someone to end up even heavier than they started. Part of this is because of the fat cells in your body never really disappear. And part of this is just plain bad habits. We see the scenario where someone gains more weight than they started with often. It is especially true when willpower has been used to force themselves to lose weight. At some point the dieter gives in and normally gives in in a big way. I relate it to a rubber band that gets stretched. It goes further and further back. But when it does finally snap it hurts. There aren’t many diets out there that work when they rely solely on willpower. That is what is great about the 3 day military diet. It is only 3 days out of seven. And it is important that you keep to only those 3 days. If we try and diet for days on end then we are likely to fail and sometimes fail harder than we have succeeded. Also on the 3 day military diet we are fed 3 meals a day. Some meals might leave us feeling a little unsatisfied but we will not be starving our bodies! Exercise should be moderate. We don’t want to give everything we have on every workout we undertake. Exercise fatigue is just as real as diet fatigue. Please don’t overdo it. If you stretch that rubber band it will snap and you will never get those gym shoes back on again. Instead try walking. And walk for weeks before you take it up in intensity or duration. Or if walking doesn’t work try whatever moderate exercise you can. The important point is to keep the momentum going. Do something that you can easily maintain for at least 30 days. We use walking because it is something that most everyone can do. Walking by itself is fantastic for you. And if that is all you do all day then great! You may eventually move up to jogging or even a marathon. And those are fantastic goals. But you have to start somewhere. And you need to do something active almost every day. If you sweep out the garage one day then you can skip the walk/run. If you mow the lawn then you don’t have to lift the weights in your basement. But you should have a goal to do something active every day. Eat natural foods. Eat fresh fruits and especially fresh vegetables. Eat foods that you prepare yourself. Eat foods that spoil. I can’t trust something that is “edible” for months or even years. Here are some ideas courtesy of Real Food for 100 days. Beverages limited to water, milk, all natural juices, naturally sweetened coffee & tea, and, to help the adults keep their sanity, wine and beer! We get the question sometimes if you should eat often or irregularly after the diet. This one comes with some controversy. There will be some that say you should eat only a big meal around 1 or 2 p.m. and then light meals for breakfast or dinner. There will be others that say you should avoid this food or avoid that food. The science seems to be clear that if you can split out your meals () throughout the day then you will have a weight loss advantage. The problem with this approach is that you tend to eat normally at each meal. If you can eat mini-meals and feel good throughout the day then this is the way to go. If you need a big meal around lunch then that is the way to go. Trust in your body. Everyone is different. What works for you won’t work for your neighbor and vice a versa. One piece of advice that we feel is the most important piece of advice we can give is eat when you are hungry. Yes it is important to only eat when your body tells you to. But what we mean is that you should eat when you are really hungry. This does take discipline but it pays enormous dividends. Food tastes so much better when you are hungry. Ever heard that “hunger is the best sauce.” No food tastes as good as food being eaten by a hungry person. You are so much more satisfied after a nice meal that kept the “stomach sharks” from swarming. You have lots of more time in your life to dedicate to other pursuits. Food is important. But it doesn’t need to be central to your life. You will get much more satisfaction out of meal than those fat chefs on TV that are always putting foie gras with every meal. This teaches discipline that translates into other areas of your life. We are not saying to starve yourself. We are saying that is ok to be hungry before you chow down. Our ancestors were hungry. If I had to have a term for this type of eating I would call it mini-intermittent fasting. And the health benefits of intermittent fasting are far too numerous to list. We aren’t even advocating fasting. We are just saying don’t drop everything anytime your stomach says it would accept a little more food. Let that hunger build. If you think we are crazy give it a try. I think you will be surprised are your results after a few days. And finally we give you permission to enjoy your life. It’s good to ask what to eat after the 3 Day Military Diet but it’s also important to your life. It’s ok to say yes to the little extras in life. You’ve worked hard. You’ve put in the time. You lost the weight. The healthy body you now enjoy is the best gift you could have given yourself. But it is ok to enjoy little treats every now and then. You don’t want to go your whole life always on a diet. But you do need to be careful. We can’t let a little enjoyment turn into full indulgence. Just try not to go overboard. If that happens you may just find yourself on another 3 day military diet.